The simplicity of classic wedding attire – in colour, in pattern, in tone – is a reflection of respect for the importance of the event. Business attire, once-upon-a-time, was similarly restrained; but while I can see the argument for relaxing clothing around the office, some formality should be kept for weddings, funerals and other one-off events. The nice thing about a wedding is that, unlike a funeral, the classic combination is also light and joyful, with a good deal of style to the monotone mixing of whites, greys and miniature patterns. You can see similar examples in the old images produced in linked posts below. The ‘wedding tie’ is usually a Macclesfield: woven black and white silk that produces a small repeated pattern and, overall, the impression of a pale or mid-grey. The suit can be grey or blue, but is perhaps most stylish in a similarly mid- to pale-grey, with the background details of white shirt and white linen handkerchief. In the case of the outfit above, at my sister’s wedding earlier in the summer, the seriousness is leavened slightly by the replacement of a boutonniere lost during the day with a paper cocktail stirrer. Still, the pink works rather well. Suit: Grey 9oz herringbone worsted from Zegna, made by Kent Haste & Lachter (cut by John). Silk tie from Tom Ford; white cotton shirt from Satriano Cinque; white linen handkerchief from Kiton. You can follow the discussion on Clothes for a wedding by entering your email address in the box below. You will then receive an email every time a new comment is added. These will also contain a link to a page where you can stop the alerts, and remove all of your related data from the site. Wedding attair?? Where’s you morning clothes? Come on Simon. We look to you for guidance. I would only ever wear morning clothes if stated in the invitation. In fact that’s probably the most important thing about wedding attire – dressing appropriately for the event, the bride and her family. Everything else is less important, even if there’s something spiffy we want to wear! Lovely outfit, but my two year old son could have tied a better knot with the tie! It seems that almost everybody in the industry has started tying their ties in that fashion. Don’t you think it’s become a little cliché and cringe-worthy? 1. When was your sister’s wedding, and to what hour did it last? I ask because in previous posts you mention the versatility of the impeccable solid navy suit with white shirt and wedding tie — how that ensemble has the ability to last you into the wee night hours as appropriate wedding evening wear because the navy is dark. What are your thoughts in general about grey suits — pale/mid-grey — and the wedding festivities lasting past midnight &c.? Or would you recommend (possibly impractical, hence the navy suit?) changing after six? Would you still prefer grey to navy? 2. Is your Tom Ford tie actually black/white shepherd’s check? From my computer screen it looks like it’s a light green with white…! Just curious…. 3. Would light blue shirts ever be appropriate for wedding attire, or is white shirts preferable? 4. 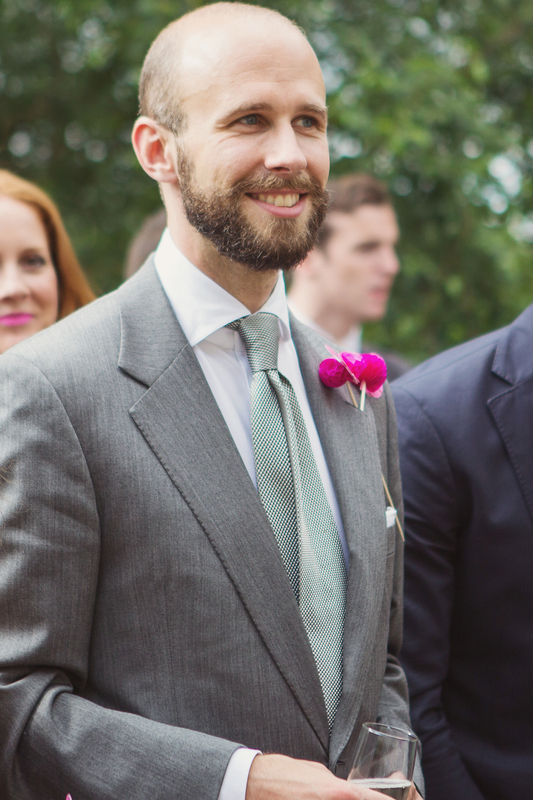 Can a grey grenadine necktie ever do double-duty as wedding attire? Every wedding I’ve attended was in the evening, and a number of them specified black tie optional on the invitation so I wore my dinner suit. The last non-black tie wedding I went to was a much more casual affair so I wore my navy hopsack blazer, which seemed appropriate for an evening occasion where a suit may have been a bit too dressy. Are most weddings in Britain during the day? I am in the market for a nice DB winter coat – however, having a frame that is slim even by asian standard, my choices are naturally restricted. I tried an aquascutum DB coat the other day and I thought the fit was quite good. However, I would only consider shelling out £800 if it is an investment piece. how do you access their quality? It’s impossible to tell without seeing the piece first hand I’m afraid – high st makers change factories and methods fairly regularly. By the way, what kind of shoes did you wear on that occasion? I’d like to compliment you on a 1st class wedding guest outfit – just enough going on to be interesting, but not so much it would detract from the bride and groom; well played. Being a long time reader time who’s wardrobe has developed and grown at a similar rate to yours over the last few years, I’d like to ask how long it takes you to decide on all the elements of your daily outfit (not necessarily just this wedding outfit), and how much do you really think about it? I’ve read elsewhere that a well curated wardrobe should enable you to get dressed in the dark, as each piece – if properly chosen, and ignoring seasonal variations – should pretty much work work with everything else. Not sure I agree, and of course having choice is wonderful, but I find it does tend to take me longer to get out of the house in the mornings now! Wonderful and very helpful post as usual, thank you! The simplicity and elegance of your outfit is perfect as is the thought process behind choosing it; the focus on the bride and groom. Just a normal four in hand… I don’t tie anything else. I’m posting on an older post here but thought most appropriate. I am attending a wedding in June. A friend of mine. It’s it not going to be a formal affair. He will be wearing a standard navy suit and is the sort of groom that spends most of the year in shorts… Yes I saw him last night… Shorts.. I live in London not LA. The question is on separates. I do not wear suits to work so I don’t really have any. Normally jackets and separate trousers. Even then overdressed. I am thinking of a grey blazer from somewhere like suit supply, something I canwear again p, maybe with jeans at a push along with some RL purple label cotton trousers (not chinos) and a pair of g&g dark oak Rothschild. I did consider buying a new suit however could not justify an expensive one as I am currently saving for a thom sweeney made to measure. For my own wedding. Am I in the wrong to wear separates to a wedding? And is my choice the right one if I do go that way? One of my best friends is getting married soon, and their wedding invitation states that the requested attire for men is “suit (no tie).” It is a morning wedding at a small chapel located in a golf country club outside the city (reception will be at the clubhouse). The male members of the wedding entourage will be wearing gray suits. I’m not part of the entourage, but I will have a minor role during the wedding ceremony. I have recently commissioned a mid-gray suit for the occasion, but as I’m not really into the idea of wearing a full suit without a tie, I plan to wear a blue raw silk tie with thin white diagonal stripes and a white shirt. Still haven’t decided whether to wear black or dark brown shoes. 1. Will wearing a tie (and thus, ignoring the dress code) be OK? 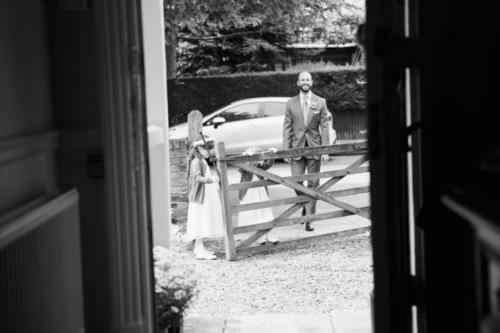 Do I risk mildly annoying the couple to be wed (actually, it will really just be the bride, as my friend, the groom, won’t really mind, I think), in order to feel more comfortable and at ease during the wedding and reception? 2. In case the couple (or their wedding planner) insists on the “no tie” requirement, I will probably just take it off then. Given that possibility, should I go for a blue shirt instead, to lessen (by just a little bit, admittedly) the I-just-got-off work look? 3. Do you have any suggestions when it comes to the outfit I plan to wear? Good question. First, I would say, you should obey the dress code. They are rarely that specific, but if they are then you really should stick to them. The day is not about you in any way, after all. And a key aspect of being well dressed in propriety. So, no tie. Either blue or white shirt could then be nice – though if you do want to break the rules slightly, an odd jacket and trousers might suit the no-tie look better. Make it very smart, eg sharp grey trousers and navy jacket, for example. If it were an event where ties were worn, I do think the outfit sounds very nice… And I’d go for black shoes. Your advise is duly noted. The reason I considered wearing the tie (aside from my own vanity, I suppose) is that I had in mind that old saying that it’s better to be over-dressed than under-dressed. But I agree with you that the fact that the couple prescribed such a specific (and unique) dress code indicates that it’s something that is important for them. I was contemplating going the odd jacket + trousers route, but since the dress code stated “suit,” I wasn’t so sure. But since you have recommended it …..
Actually, for what it’s worth, in our part of the world, any outfit that involves a tailored jacket worn with any sort of trousers will already be considered a “suit,” thereby making the wearer sufficiently dressed up for almost any occasion (I don’t know if that makes sad or relieved). Thanks again for taking the time to respond, Simon. Cheers. I have been a keen follower of your blog for years and always very much enjoyed your instructive and detailed content (although my bank account less so :)). I am getting married this summer in Spain (God willing..) and am very lucky to have a great number of suits from my late father and grandfather that all fit well, of which a few suits from Nutters, a dinner jacket from Caraceni and a morning coat from Tom Brown. I have always worn the latter at weddings, and although the fit is impeccable, I think that the cloth is just too thick for a summer wedding in Spain (it dates back to the 80s..) with all that a wedding implies of sweat-inducing activities: too much dancing and chats with the in-laws! I am therefore thinking of getting a new one made, and there comes the doubt. I have had a suit made (MTM) by Thom Sweeney, and although it is not bespoke, the fit is great and I enjoy the modern and flattering cut very much. Today a three piece MTM suit there starts at £1,600 (probably £1,800 for a morning coat). On the other hand I have had another, full bespoke, suit made at Sastreria Serna in Madrid (the military tailor to the king of Spain) and which cost me a reasonable €1,800 in a beautiful charcoal H&S flannel. The fit and details (including handmade milanese buttonholes, flower loop etc..) are stunning but the cut is a bit… “Spanish”: the lapels are a bit wide and round, the shoulders a bit square, etc… maybe you know what I mean? Overall it doesn’t feel as “fine” as an English cut. As a result I am not sure of which option to go for. I do not want to go bespoke at TS as that would be above budget but I do enjoy the English cut and on the other hand I realise that the first bespoke suit is never meant to be perfect. What would you recommend? Do you think I should take a style risk and go for a better fitting, probably better quality, fully hand-made bespoke suit from Serna again or go for the paradoxically more expensive MTM option at Thom Sweeney? Many thanks for all your work on the blog and I look forward to hearing from you. It’s hard to judge that directly as I don’t know Serna’s style or how good a fit the Thom Sweeney was. Have you looked at other bespoke tailors in that price range, eg Whitcomb & Shaftesbury? Thanks Simon. No I haven’t looked at those alternatives and thanks for mentioning them, I just sent an email to W&S! Would it help at all if I sent you pictures of the two suits via email? I feel the Serna suits have a bit more of a “drape” cut, with lots of fabric at the shoulder and upper legs, which is a bit different from Sweeney. I guess the question is: if the difference in quality between the two is clear and I would prefer Serna with that metric in mind, is style something that can be managed with sufficient explanations? Hi Simon, thanks a lot for the honest feedback which is much appreciated. I have a question where your knowledge would be very valuable if you have some time. I’m getting married in Italy at the end of August and we’ve decided the event to be black tie. I have decided against a morning coat and I will be wearing a tuxedo. While I initially started looking at midnight blue, I’ve tried a white jacket and will likely go this way as it would better fit the weather and setting of the place. I’ve been shopping around quite extensively and I’m having a hard time finding a suit that fits me well. I have a prominent chest with an hour glass figure so most jacket would either look very blocky on me or would be very open on the chest. So far, the best I’ve tried is Zegna, with Tom Ford being a close second. I’ve been thinking going bespoke or MTM however, I’ve never went this route before and I have no relation with any tailor. It’s something that I would enjoy creating but it’s the most expensive option and without any idea of the final result. I also wouldn’t wear a tuxedo on a regular basis so it doesn’t make a lot of sense money-wise. I’ve read about your experience with Whitcomb and it’s somethign I would envisage doing. So, based on your experience, would you recommend that I rather go the “retail” way (most likely an MTM Zegna) or that I take leap of faith with a bespoke tailor? Given you’re having issues finding RTW that fits you well, I would certainly recommend bespoke. I recommend it anyway if you can afford it (and W&S will be around the same price as the other options you’re looking at) but if the body shape is an issue, then definitely. I wouldn’t worry too much about not having an existing relationship with a tailor, as a tuxedo will be a relatively fixed style to commission. This adds a level of excitement to the whole process that you don’t find in RTW. I’ve been wanting to dip into the bespoke world for a while so I’m happy with my choice. I hope this lines find you well. Usually I would wear my navy suit, however, if I do so, this would be the fourth wedding in a row where I would be using the same suit, which is a bit boring. Therefore I was thinking this time I could wear a fine dark grey bespoke suit (the shade of which is slightly darker than the one display on your picture above). Would such an option be appropriated? Thank you so much in advance for your views on the subject. Would you consider wearing a double breasted suit to a wedding where the groom wears a single breasted one inappropriate? Would this count as ”outdressing the groom?” and should ne avoided? Are dark brown Derbies a faux-pas for a wedding guest at a 2pm-2am wedding with a suit-and-tie dress code? I recently bought a nice pair from Santoni, very dressy and beautiful, but I know Oxfords are a standard. The suit would be quite similar to the one you’re wearing here, by Chester Barrie, a white shirt, and the tie a smart beige herringbone semi-shiny silk piece from Marinella. For sure no one will notice, or likely care, but we are doing this classical dressing mostly for ourselves, aren’t we? 🙂 Thanks for confirming, I knew I was really stretching it.